Malignant lymphoma of the thyroid gland is uncommon, representing only 2 to 5% of all thyroid malignancies, and is often associated with autoimmune disorders, such as Hashimoto’s thyroiditis . Many reported cases are B-cell lymphomas of the thyroid, which include marginal zone B cell lymphoma of the mucosa-associated lymphoid tissue (MALT) type (maltoma) and diffuse large B-cell lymphoma. Primary T-cell lymphomas are extremely rare at less than 2% of all primary lymphomas of the thyroid gland. The present case report describes a rare case of primary T-cell lymphoma associated with Hashimoto’s thyroiditis that was difficult to diagnose pathologically. It was, therefore, useful to diagnose through means of genetic study. A 70-year-old woman was referred to our clinic, complaining of rapid anterior swelling at the neck. A diffuse firm goiter was observed and the patient indicated feeling oppression of the neck. No lymph node swelling was observed. The patient has a past history of hypothyroidism and enlargement 10 years earlier and takes 50 μg levothyroxinesodiumdaily. Laboratory examination indicated almost normal thyroid function (free T4 1.3 ng/dL, free T3 3.6 ng/dL, thyroid-stimulating hormone (TSH) 0.04 m unit/mL, thyroglobulin 600 ng/mL) with anti-microsome antibodies and anti-thyroglobulin antibodies. The s-IL-2 Receptor antibody measured as high as 970 U/ml. However, thyroxine-supplementation could not decrease the size of the thyroid. The thyroid gland continued to enlarge and diffuse, and was approximately 5 cm thick at the isthmus portion on the ultrasonographic examination. A computed tomography (CT) scan showed a huge thyroid enlargement with decreased internal density (Figure 1). There was no obvious mass lesion in the thyroid. The enlarged thyroid gland was well demarcated. CT and ultrasonographic examination. (a) CT shows the diffuse enlarged thyroid gland without nodule. (b) Ultrasonographic examination demonstrates a homogenous enlargement of the thyroid gland not so low echogenecity as typical malignant lymphoma. 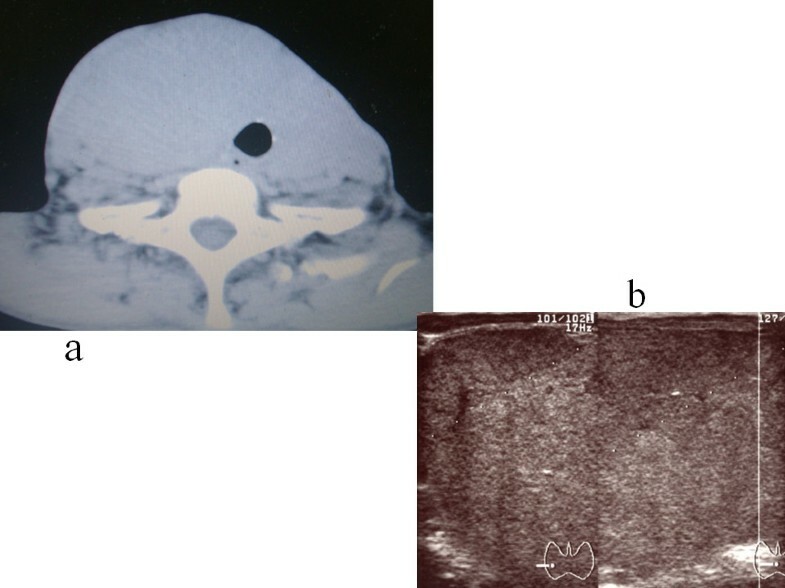 On FDG-PET (18 F-fluorodeoxy glucose-Positron Emission Tomography) examination, the FDG accumulation was detected in the enlarged thyroid region, suggestive of Hashimoto’s thyroiditis and/or lymphoma. Serological examinations were negative for human T-cell lymphoma virus type 1 (HTLV-1). Fine needle aspiration cytology suggested the case was consistent with Hashimoto’s thyroiditis. Although we suspected possible malignant lymphoma associated with Hashimoto’s thyroiditis from the large thyroid size and a rapid growth rate, the diagnosis was not confirmed. Therefore, the right hemithyroidectomy was performed to obtain a definite diagnosis and relief of the local symptoms caused by an enlarged goiter (Figure 2). Histological examination revealed diffuse small lymphocytic infiltration in the thyroid gland associated with Hashimoto’s thyroiditis. However, Southern blot analysis of tumor specimens revealed only a monoclonal T-cell receptor gene rearrangement. The final diagnosis was peripheral T cell lymphoma. Therefore, a left hemithyroidectomy was also performed one month later. No adjuvant therapy was performed because of the tumor stage and its subtype. The patient has been well with no recurrence or no metastasis. Furthermore, no additional medication has been required for 22 months since the surgery. Operative findings. a) First operative finding: the right hemithyroidectomy was performed without any complication. b) Second operative finding: the arrow indicates a left recurrent laryngeal nerve. The arrow head indicates a parathyroid gland with supplying artery. 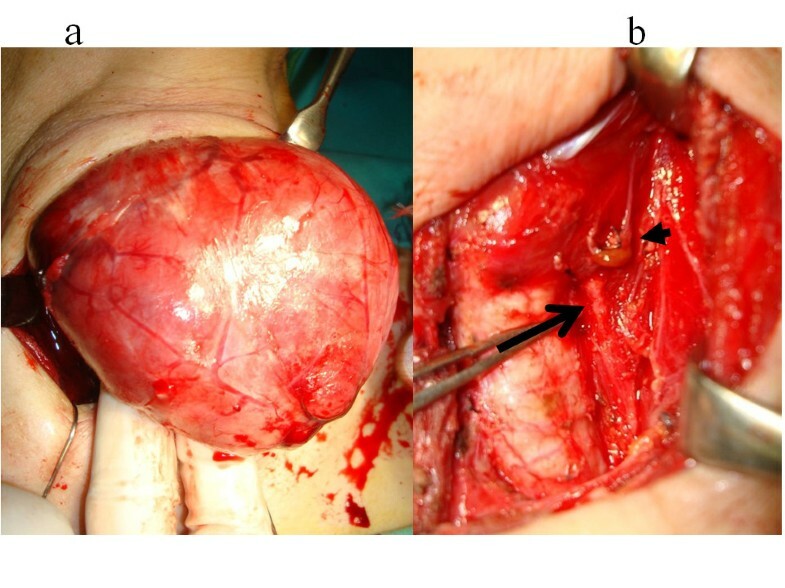 Macroscopically, the resected thyroid gland was diffusely enlarged, but the thyroid tumor was firmly encapsulated without extracapsular spread. The cut surface of the thyroid had pale white medullary components. Histologically, severe and diffuse infiltration of the lymphoid cells was found in the medullary region. Lymph follicle formation with germinal centers was noted in the periphery of the medullary region. Atypical lymphoid infiltrations were also located among the atrophic thyroid follicles. In the medullary area, infiltrated lymphoid cells were relatively uniform, small-to-medium sized, round cells with a high nuclear to cytoplasmic (N/C) ratio. These cells had round nuclei with increased coarse chromatin and small nucleoli. Mitotic figures were often seen as high as 60% in high-power fields (Figure 3). These findings suggested small lymphocytic lymphoma. The atrophic thyroid epithelia showed enlarged and eosinophilic granular cytoplasm with large nuclei, so-called Hürthle cell metaplasia. Around these Hürthle cells there were many plasma cells, lymph follicles with germinal centers and a few eosinophils (Figure 3). These findings suggested complication of Hashimoto’s thyroiditis. Microscopic findings and immunohistochemical staining. 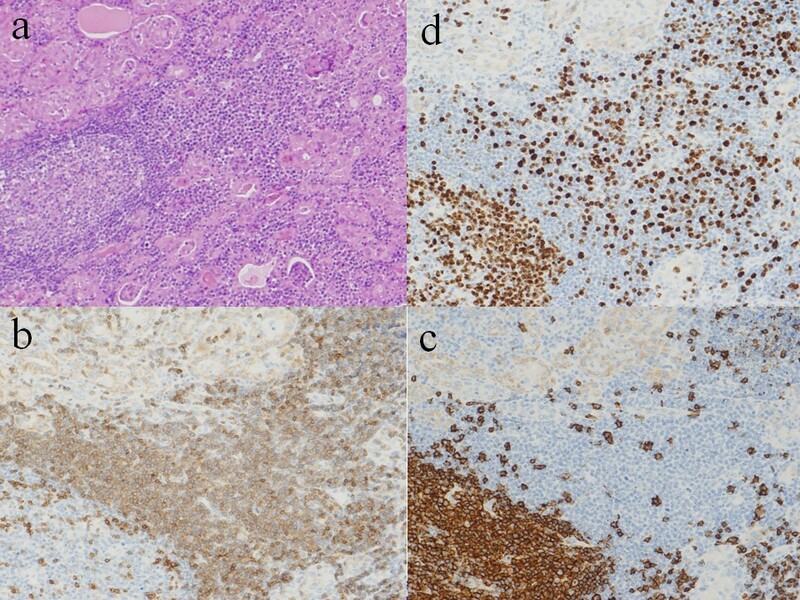 (a) Low-power view of histological examinations revealed massive infiltration of small monotonous lymphocytes, which were difficult to distinguish tumor cells from reactive lymphocytes in Hashimoto’s thyroiditis. (Hematoxylin and eosin staining, X100). (b) Immunohistochemical staining showed that tumor cells had T-cell markers for CD3, (X400). (c) Immunohistochemical staining by CD20 showed infiltrated lymphoid cells had B-cell markers, (X400). (d) MIB staining. MIB 1 index was as high as 60% in high-power fields, (X400). Immunohistochemical examinations were performed on formalin-fixed, paraffin-embedded specimens, using an autostaining system according to the manufacturer’s protocol. From these results, diffusely infiltrated lymphocytes were positive for T-cell markers (CD3 and CD45RO) and positive for B-cell markers (CD20). However, infiltrated atypical T cells showed CD3 dominancy (Figures 3 and 4). In contrast, lymphoid cells of the peripheral area with lymph follicles showed an admixture of T and B cells, mimicking lymph follicles. High power magnification. (Hematoxylin and eosin staining, X400). With the high-power view, tumor cells had a high nuclear to cytoplasmic (N/C) ratio, coarse nuclear chromatin with prominent nucleoli. Surface marker analysis of the freshly resected tumor showed T-cell dominancy (CD2+, CD3+, CD4+, CD5+,CD45+). There was also a small population of B-cell lineage, with no dissociation of surface membranous immunoglobulin light chain kappa or lambda. These data suggest the polyclonal nature of infiltrated B lymphocytes associated with Hashimoto’s thyroiditis. Polymerase chain reactions (PCR) for detection of rearrangement of immunoglobulin heavy chain (IgH) hypervariable region and T-cell receptor (TCR) were performed using fresh specimens as described previously . PCR showed a polyclonal pattern for both IgH and TCR. Southern blot analysis produced a rearrangement band of TCR- γ by Hin d III digestion and TCR- β by BamH I digestion (Figure 5). There was no rearrangement of the TCR- δ chain or IgH. Southern blot analysis (rearrangement). 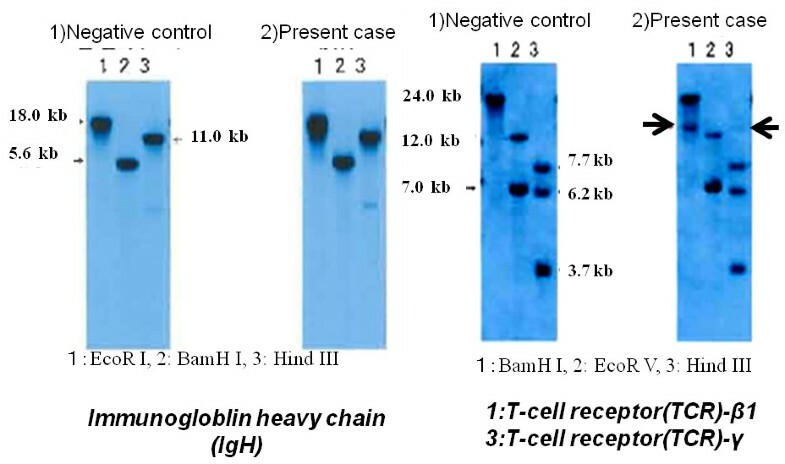 (a) Rearrangement of the immunogloblin heavy chain (IgH) were negative, and (b) rearrangements of T-cell receptor (TCR)- β1 (lane 1) and TCR-γ (lane 2) were found in the present case. Rearrangement of TCR- δ was negative in the present case. M, molecular weight marker; 1, normal control (human placental DNA); 2, present case. 1, BamH I; 2, EcoR V; 3, Hind III. We diagnosed peripheral T-cell lymphoma of the thyroid gland associated with Hashimoto’s thyroiditis using molecular analysis. No other organ involvement of lymphoma was demonstrated, including the lymph nodes, the mediastinum and the bone marrow. Therefore, we considered this case to be a rare primary T-cell lymphoma of the thyroid gland, clinical stage I E-A with bulky mass. However, malignant lymphoma is a minor component of thyroid tumors, accounting for only 2 to 5% of all thyroid malignancies. Malignant lymphoma of the thyroid gland is often associated with Hashimoto’s thyroiditis . Most thyroid lymphomas are of the B-cell type, including maltoma and diffuse large B-cell lymphoma. T-cell lymphoma of the thyroid gland is extremely rare with only 15 cases reported in literature (Table 1) [3–15]. Most patients had a past history of Hashimoto’s thyroiditis, which affected female subjects more than male subjects. Most patients also had a history of rapid thyroid enlargement, sometimes accompanied with hoarseness or dysphasia. Open biopsy was the most common method of diagnosis; however, it is difficult to make a reliable diagnosis of thyroid malignant lymphoma. In the present case, a hemithyroidectomy was performed without a biopsy. Progression of malignant lymphoma in the thyroid was suspected from the clinical course, such as rapid growth and an enlarged thyroid tumor associated with Hashimoto’s thyroiditis. References*, Number in brackets indicate reference numbers and other numbers indicate published year; N/A, not available; C, chemotherapy; DFS, disease-free survival; DUC, died of unrelated cause; IgH, immunoglobulin heavy chain; PCR, polymerase chain reaction; R, radiation therapy; S, surgery; TCR, T-cell receptor. Histological examinations revealed massive infiltration of small monotonous lymphocytes, which were difficult to distinguish from reactive lymphocytes in Hashimoto’s thyroiditis. Immunohistochemical examination showed that these lymphocytes had T-cell markers (CD3 and CD45RO). However, the first pathological diagnosis could not accurately diagnose T-cell lymphomas. There are some reasons for the misdiagnosis in the current case. First, Hashimoto’s thyroiditis induced complicated massive infiltration of small lymphocytes, which were stained with B cell markers and T cell markers. It was difficult to distinguish tumor cells from reactive lymphocytes in Hashimoto’s thyroiditis. Second, T-cell lymphomas of the thyroid gland are very rare and cannot be easily referred to as an indicator. Third, present pathology has developed into various subdivisions and many pathologists have not always specialized in detecting malignant lymphoma disease. On the absence of a reliable immunohistochemical marker of clonality of T-lymphocytes, genetic study is recommended as the most useful method to detect the presence of a dominant T-cell clone in a lymphocytic infiltrate [16, 17]. After the 1990s, developments of molecular diagnosis, primary T-cell lymphomas of the thyroid gland were detected accurately, and slightly more cases were reported than before the 1980s. In the present case, PCR could not detect the monoclonality of the TCR; however, monoclonality of the proliferated lymphoid cells was seen on Southern blot analysis. T-cell lymphomas are generally considered to have worse prognoses than B-cell lymphomas. However, with the exception of three, all reported patients with T-cell lymphomas did not die from the disease. Treatment of thyroid T-cell lymphoma has focused on a combination of chemoradiotherapy and surgery, but no consensus has been reached. In the present case, only surgical resection was performed without chemotherapy or irradiation. 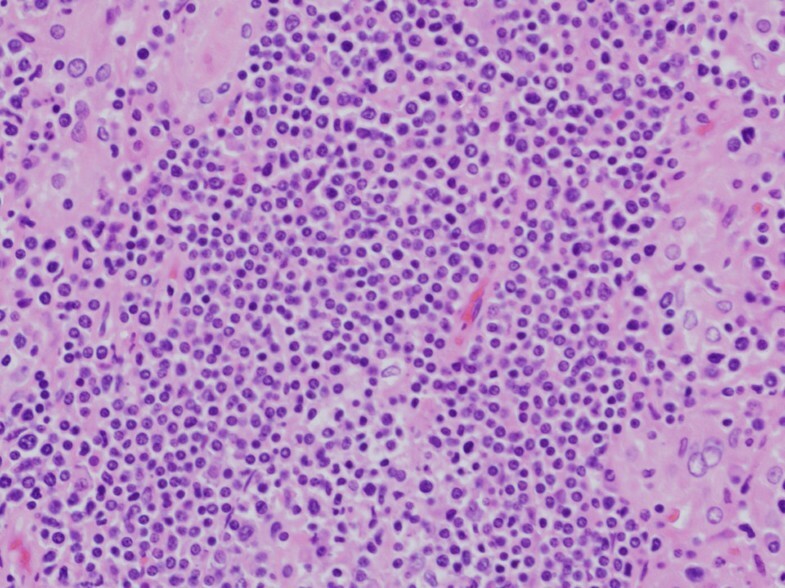 This was because histology of the tumor showed that it was a low-grade lymphoma without extra-capsule spread. In addition, pathologically we found lymph node metastasis. Furthermore, the patient was a little old for chemotherapy and T cell lymphoma is generally resistant to chemotherapy or irradiation. Based on the literature available, we considered that adjuvant chemoradiotherapy could not contribute to a better prognosis than surgery alone (Table 1). However, further investigations are needed to clarify this matter. Here we emphasized that a very rare case of peripheral T-cell lymphoma of thyroid gland with Hashimoto’s thyroiditis was effectively diagnosed by the gene rearrangement procedure. Particularly, patients with rapid thyroid enlargement accompanied with Hashimoto’s thyroiditis should also be examined by the gene rearrangement procedure. This study was supported in part by Grants-in Aid for Scientific Research from the Ministry of Education, Culture, Sports, and Technology (22591920) of Japan.